Imagine for a moment that in your garden you grow the prettiest of flowers and the tastiest of vegetables. Then one day, as you make your regular journey to your not-so-tidy compost heap at the bottom of the garden, you find that the unruly heap is angry, has sprouted legs and is ready to chase you around the garden! 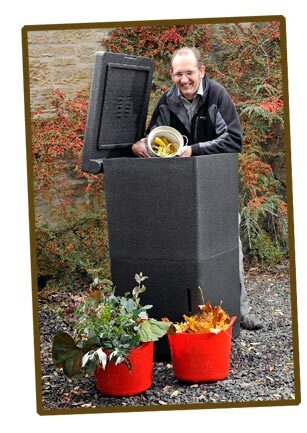 Humour aside, it was actually an unruly compost bin which spearheaded the design and development of the HOTBIN by inventor Tony Callaghan (Morpeth based AC Innovations). Tony had his passion for environmental science reignited after his wife informed him that if he didn’t sort out his unruly, overflowing compost bin – there would indeed be trouble! Tony spent two years getting to grips with science, technology and going back to the basics of industrial composting to develop a bin that would reverse overnight how much waste gets sent to landfill. With support from Northstar Ventures and manufacturing partner DS Smith Plastics, his focus was on developing a HOT composting bin. After many trials and to the delight from his wife, Tony’s final design was true to its name. Launched to the public in late 2011, the HOT composting bin, aptly named the HOTBIN could reach temperatures of 40-60°c and produce compost in 30-90 days by composting more types of waste quicker than traditional cold composting heaps. HOTBIN was soon receiving rave reviews from home composters, allotment holders and professional gardeners alike and was successfully tested by Garden Organic, a charity dedicated to promoting organic gardening and inspiring people to grow in a sustainable way. Garden Organic tested the HOTBIN for ease of use, effectiveness and compost quality in their research field at Ryton Gardens. HOTBIN is focused on re-educating people that home composting can really make a significant impact on how much waste is diverted from landfill using a composting system that is safe, easy to use and can recycle a wider variety of waste. HOTBIN is now one the UKs top selling compost bins. At launch the business was awarded "Northumberland Green Business 2012" and “Product Innovation of the Year” in 2012 by readers of Grow Your Own magazine. Since then HOTBIN has been featured on The Alan Titchmarsh Show, Saturday Morning with James Martin, Beechgrove Gardens, Radio 2 Drivetime Show, in the Guardian and in The Telegraph as one of the three best compost bins. The HOTBIN has received the seal of approval from well respected gardener Alys Fowler, RHS Gold medalist garden designer Robert Barker and previous editor of Gardeners World magazine, Adam Pasco. In 2018 HOTBIN was the winner of "Best Compost Making Product" in the Great British Growing Awards and is now a member of GIMA. The HOTBIN is 100% recyclable and is manufactured in Spennymoor, County Durham.